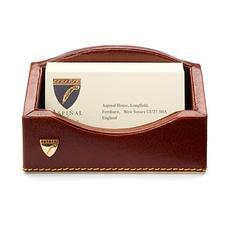 Elevate your professional image and dress your desk with an immaculately handcrafted Business Card Holder. Characterised by its sweeping lines and contrast hand stitching, each holder is made from solid cedar wood before being bound in the finest leather. 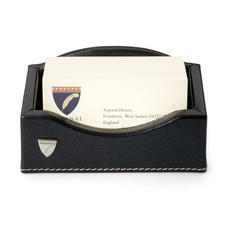 Soft suede lining and a deluxe padded interior will keep your cards in pristine condition. Our Aspinal shield adds a subtle yet elegant level of luxury. Choose from a range of classic tones to complement your interior style.